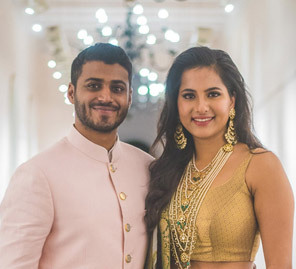 Sagar and Geeta’s beautiful wedding in Goa included striking ensembles, regal venues, and carnival-like atmosphere. 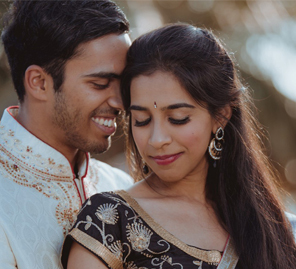 Geeta and Sagar’s love story began a few years ago and resulted in a beautiful wedding at Alila Diwa Goa. 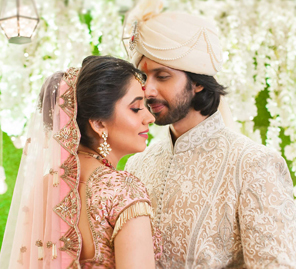 Here, the bride shares stories from the celebrations and highlights captured in candid pictures. “Sagar and I have lived in Dubai for a decade now. He is a private equity fund manager, I am into private banking! He’s a Hindu Marwari, I’m a Christian Maharashtrian. We met through common friends and sparks flew instantly. We started spending time together to get to know each other and became the best of friends. We realized the bond we forged was something else and Cupid had struck. Convincing our parents wasn’t easy given our disparate cultural and religious backgrounds but after a lot of nudging, arguing and convincing, the approval was granted! “Alila Diwa Goa sprawls over several acres, surrounded by lush green paddy fields. Sagar had booked it and it was only a month later that I set foot on the property and knew instantly he’d chosen the best. Its massive lobby instantly welcomes guests. The pool deck and bar were perfect for a pool party. The beautiful lawns and verandah were where we would do our pheras and the banquet would accommodate all our guests. Even the walkway was long enough for a baraat! “I’d always wanted a beach wedding like in the movies; an altar by the ocean, a couple looking into each other’s eyes with the sunset as backdrop. Alila Diwa is not by the ocean which was disappointing at first, but the hotel recommended Zeebop, a restaurant and bar by the sea. “I’d recommend a pool party with every single mehndi! You kill an afternoon, deal with the heat and the mehndi is happening! The colors were yellow, orange and green and I wore a green outfit and Sagar wore yellow to match the theme. We took over the entire pool deck at Alila. The entry was made up of several pool props which was cute and quirky and the deck had a mandap set up. There was a rain dance set to make sure even those who didn’t jump into the pool got wet. Our hashtag #weddingsaga was put up so it was in all the pictures. The décor had a Polynesian theme; large wooden tiki sculptures, floral drapes, fruity cocktails, flowers and that RAIN dance for a fun dance floor! “Sagar’s friends are always calling him ‘Hero’! So keeping my hero in mind, our sangeet was Bollywood Style – red carpet entry for our guests, paparazzi chasing them for pics, the stage lit up with lights, camera, ready for the dance action between Team Bride and Team Groom! The evening started with our friends and cousins making a grand entrance to the song ‘Chalti hain kya 9 se 12’ and us bringing up the rear. Post our little performance, we exchanged rings and the night transformed into an awards night! We felicitated everyone from Best Jodi to Best Performer to Best Parents etc. We even gave away little golden ladies (akin to Filmfare’s Black Lady - provided by our decorator) to award winners. The event was hosted by our favorite RJ Vicky from Suno 1024. He is a very dear friend and he spread his charm throughout the night. There were 15 performances planned by both sides of the family. It began with ‘Kala Chashma’ by Sagar’s mom and mami to ‘Nawari maajhi’ by my mom and my sisters. The last performance of the night was by my friends wearing Marathi nawaris and dancing to ‘Zingaat’. It was like holi but with just one color! “Both sets of families had separate functions, with the same color on all our faces! The groom’s side had loud laughs, tearing of clothes and constant giggles! 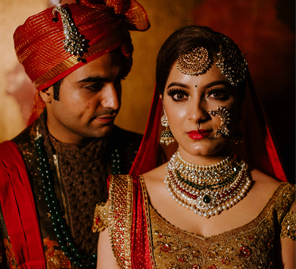 The bride’s side was more emotional with teary eyes around.” The bride changed into the traditional 9-yard yellow Nawari saree and the groom looked relaxed in a white chikan kurta pyjama and a beautiful ocean blue jacket. “There were only pheras and a reception planned for this day. The Alila lawns are huge and have a great backdrop of trees. We kept the theme traditional; red and pink. I wore a maroon lehenga and Sagar looked like a Rajasthani prince in his royal sherwani.